I love The Legend of Zelda, Wind Waker. It was the game my wife and I played every night when we first got married, it was the reason we bought a Wii-U and has just been a very happy memory in our lives. I love the art style and was particularly struck by the story intro and how it was presented in a woodcut print style. 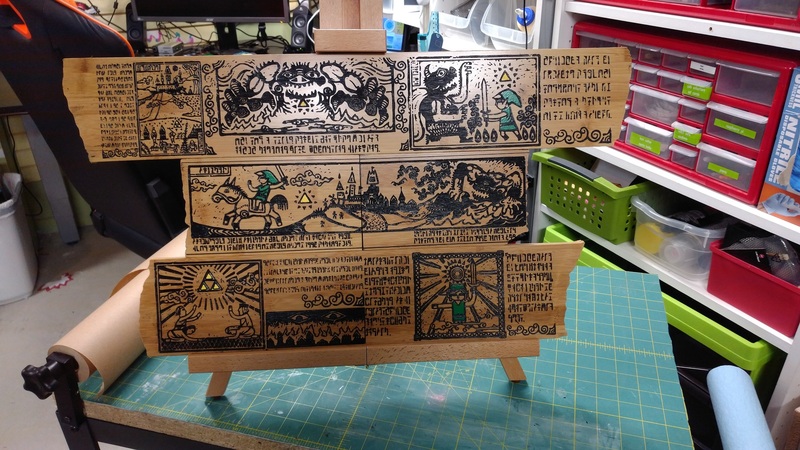 When I got access to a laser cutter at my local maker space, I decided that the first thing I would try was to rasterize a version of those intro panels onto some wood. It worked really well, so I went bigger. Lots bigger. I wanted to do the entire piece in bamboo. Turns out that stuff is expensive to buy and hard to source. It also turns out that bamboo flooring is cheap to buy and very easy to source, so I took my rebate check to Menards and walked out with two boxes of 3/4 solid bamboo flooring. After a little quality time on the table saw, I was able to cut off the tongue and groove of the boards and was left with 120mm wide boards. We use rdworks to drive the laser, so after converting the images to 1bit black and white, I loaded them up and resized them to fit my120mm width and let the light do it’s thing. Right off the machine, the image looks pretty nice, but it doesn’t really pop so the next step is to ink in all of the lasered sections with black paint. This isn’t nearly as bad as it sounds. Because the wood was already coated with an epoxy (it’s flooring remember) and is designed to resist stains, you can pretty much flood paint across the surface, wait for it to dry and then scrape it off of all of the high areas. The paint will stay fixed inside the lasered sections because all of the epoxy was burned off and the image will really jump off the wood. I just use some watered down acrylic paint that I brush on heavily and then wait to dry. like seriously, brush it on. Once the paint has dried, getting it off of the treated bits is pretty simple. The best way I’ve found is to first dampen the surface a bit, not a ton, but enough that the paint changes back to a glossy color. Then you take a razor blade and scrape along the surface. The paint will roll right off as long as you don’t press too hard or go to fast. You’ll occasionally have spots that will lose the paint that was inside of the lasered section (usually from too much water) but that’s easy enough to just fill in and wipe clean. Up to this point, it’s been pretty hard to screw up. Any mistakes can just be washed off, but now comes the color. This bit is unforgiving because you’re actually painting onto the treated surface, which doesn’t want paint, right next to the untreated surface, that really wants paint. The only advice here is to use a very tiny brush and to go really, really slow. I use a metallic yellow for the triforce and a generic green for Link. Now the piece needs to dry. It’s very fragile at this point, the colored parts will wipe right off if you touch them with just about anything, so let it sit overnight. The next step is to seal it up. I use a satin polyurethane because it’s tough, it sprays clean, dries fast and is what I had in my garage. Just lay the pieces out, spray it on and let it dry. Once it’s dried it will be considerably tougher and we can move on to cutting and shaping. I use a small block plane to put a bevel on the edges in between the pieces. It’s not something that has to be done, but it makes the piece look more organic and less…flooring. To shape the edges I use a handheld router. I don’t know why this tool scares me so much, but I dread this part more then all of the others. I just take the router and free hand the edges to get it into a shape I like. I hate this part. I’m positive this tool wants me dead. And that’s it. I mounted the finished panels onto a $3 portable easel and it sits on top of my coat closet.